Karditsa-net. - Plastiras. A "balcony" over the plain and Plastiras Lake. The municipality of Plastiras with its seat Morfovouni, is located in the southwest part of the prefecture of Karditsa and covers the northeast area of the Plastiras Lake. Its population comes up to 3.961 people. Lambero and Kerasia villages are located on the Nevropolis plateau near the lake. Moshato, Mesenikolas and Morfovouni constitute the "balcony" of the municipality over the Thessaly plain. 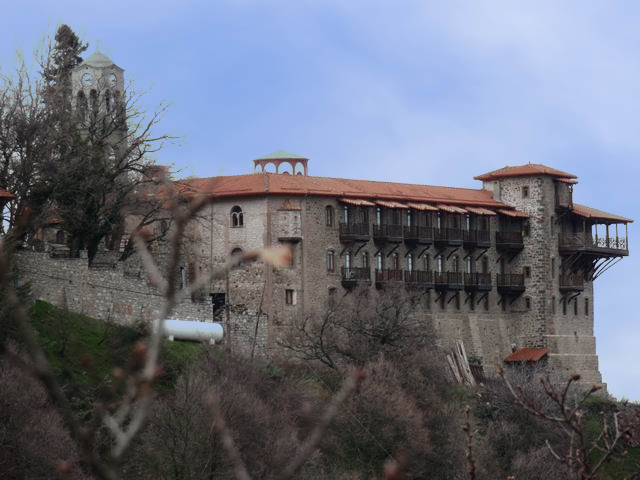 The most important Byzantine and Post-Byantine monuments of the Municipality of Plastiras are: The Holy Monastery of Korona, the Holy Monastery of the Dormition of the Theotokos in the village of Kerasia, the chapel of the Life-Giving fountain (Zoodohou Pigis) in Mesenikolas, the Monastery of the Holy Trinity in Morfovouni. As regards modern monuments, the stone bridge at Moshato and the arched bridges of Kerasia are worth mentioning. Cultural events lasting for many days are oranized in August in all the boroughs of the prefecture as well as a fishing competition, a mountain bike contest and the swimming crossing of the lake. The long experience of the viniculturalists, the favourable climate conditions and the morphology of the ground in the area have contributed to the production of quality vinification and distillation products. The prefecture of Plastiras includes the VQPRD Viniculture Zone of Moshato - Mesenikolas - Morfovouni, where the following varieties are cultivated: Roditis, Batiki, Hamburg Muscat, Chardonnay, Carignan etc. The local black Mesenikolas variety, a mixture of Syrah and Carignan stands out, producing the red VQPRD wine "Mesenikolas", quality wine produced in a specific region, after ageing in oak barrels. East route following the shore of the lake: Two important road axes start from Mitropoli going past the villages of the municipality of Plastiras and reaching the beautiful plateau and Plastiras Lake. Following the east route of the Mitropoli junction we end up in the east side of the lake. The route is extremely beautiful with a panoramic view over the Thessaly plain. On the left of the road, three km from Mitropolis, we come upon the artificial lake, the hydroelectric plant of Plastiras Lake and taverns, open all year round. On the way, after a while, we reach Moshato: a village 15 km from Karditsa, at an altitude of 450 meters, with a beautiful view and tourist infrastructure (guest houses, restaurants), a big square, parking spaces and a cool breeze even in summer months. In the outskirts of the village, one can admire the single-arched stone bridge dating from the end of the 18th or the beginning of the 19th centuries. Going up on the narrow winding road towards Plastiras Lake, the view is extraordinary. Far away in the horizon, one can see Trikala, the snowcapped Mountain Olympus on the right nd Mountain Kissavos next to it. Closer to the visitor is the Thessaly plain, with its big vriety of colours, depending on the season, along with the town of karditsa and surrounding villages, the artificial lake with the blue waters, more or less full depending on the irrigation needs of the plain and the water supply needs of the people, the hydroelectric plant, the big metal pipe transporting water from the lake etc. The rich and multi-coloured lighting in the vast Thessaly plain and the yellow bright line of the metal pipe create a unique feeling during the night making the route even more pleasurable. At the top of the hill, over Moschato and at an altitude of approximately 800 m. the imposing Holy Monastery of Korona dominates the landscape. It is one of the most important religious monuments of the region. It is located on a prominent position with an unhindered view over the plain, 18 km from Karditsa and very close to Plastiras Lake. According to the tradition, the owner of the monastery was the emperor J.Komnenos II. The monastery was destroyed during raids and was rebuilt at the beginning of the 15th century. It has an elaborate altar screen constructed at the beginning of 1700 by local carvers regarded as one of the best of the Thessaly region. The skull of the neo-martyr local saint, Saint Seraphim, who also was the superiorof the monastery, is kept there. The frescoes (by the monk Daniel, 1587) are the oldest in the Agrafa region. The monastery of Korona was an important religious and spiritual centre as well as an important base during all the liberating wars. Today it attracts thousands of visitors. It is open to visitors according to a specific schedule (Telephone: 24410 22250). The monastery celebrates the Theotokos' birthday on the 8th of September. From the old road that passes below the Holy Monastery, we can reach the west side of Plastiras Lake and the other villages of the municipality of Plastiras. We continue our tour following the road axis on the east shore of the lake. To the south of the Monastery of Korona and in a distance of approximately 600 m, there is Tsardaki. 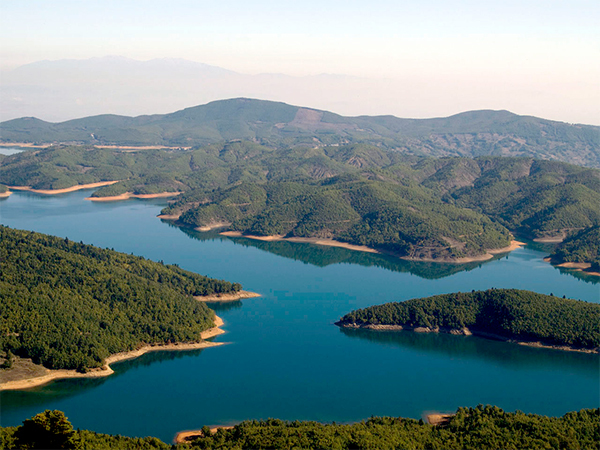 Prior to the creation of the lake, Tsardaki was an important communication center as it was the place crossed by thousands of Agrafiotes going to the lowland areas, the town of Karditsa and the rest of Greece. The travellers used to rest in the shacks (tsardakia) of the area before continuing their journey. Today, the shacks' place has been taken by modern taverns and guest houses for accommodation, maintaining many of the traditional elements. This is the point of departure of the cycle road which ends in Mesenikolas. Every year in August, with the initiative of the municipality, a mountain bike competition is held starting from Tsardaki and finishing in Mesenikolas. The wide asphalted road from Tsardaki leads us to Lambero Beach, 3 km to the south. the two big taverns next to the lake's waters are open every day with comfortable parking spaces and landscaped outdoor areas, generously offering the wonderful smell of nature, hospitality, local tastes, cooked dishes, coffees and refreshments for all tastes. Visitors can find friendly service, souvenirs, information leaflets and valuable information about thw region at the tourist pavilions. On the other side of the lake, the mountaintops of Karavas, Voutsikaki, Borlero, the sleeping lady of the Agrafa (The Agrafa topsform the figure of a lady sleeping) etc stand out. The sunset in the area offers unique moments. Two km from Lambero beach, on the way to the villages of the municipality of Itamos, we come upon Aghios Athanasios, a housing settlement of Lambero, which is small but under development, offering significant tourist infrastructure, rooms to let and taverns with quality services. Starting from Aghios Athanasios, a road of 5 km (a part of which is not asphalted for the time being but it is quite accessible for the biggest part of the year) leads us to the Holy Monastery of Petra, near Katafygi village. 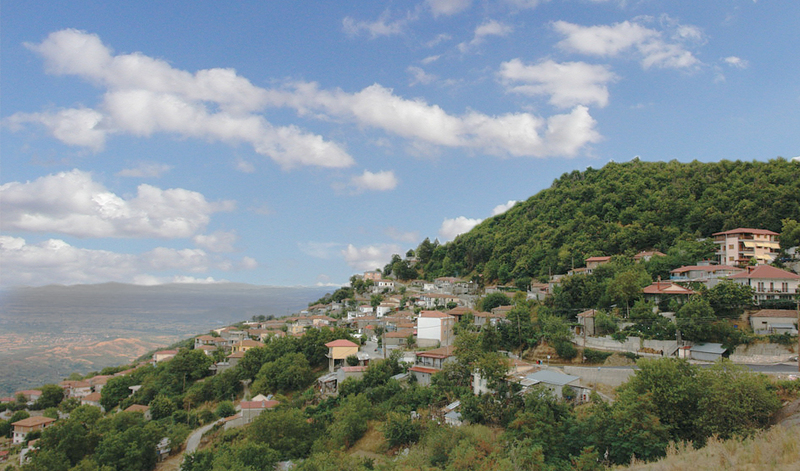 Five km to the south of Aghios Athanasios is Kastania, a village built on a slope if Itamos, under a forest with towering firs. The route to the village is extremelypleasant and pnoramic in the biggest prt. The thessaly plain extends to our left. The lake is to our right and in the horizon, we see the villages of the west side of the Sleeping Lady of Agrafa, the arched dam of the Tavropos river. From Kastania, the beautiful village of the municipalityof Itamos, many choices open before us depending on our destination. This is the end of the tour on the east side of the lake. We are now going to tour the remaining villages of the Prefecture of Plastiras nd the road axis on the west shore of the lake. Starting from the town of Karditsa and Mitropoli, we follow the route going to the west side of the plateau and Plastiras Lake. Going up from Mitropoli to the lake, we see the villages of Mesenikolas and Morfovouni to our left of the Agrafa mountain slopes. Mesenikolas, about 22 km from Karditsa, is a big village, amphitheatrically built at an altitude of 700 m, with a long history and rich viniv tradition. It has a quite good tourist infrastructure, traditional cafes, renovated guest house, cultural center and the Wine and Vine museum. Every year on the 15th of August, the Wine Festival is held with a rich cultural programme and many other events. the visitors are offered free local wine. More than 30 wine makers of the village offer select wines nd tsipouro to the hundreds of visitors and passers-by. There are modern bottling facilities in the village for the produced wines which are wider known for their qualityand taste. The region, as the whole minicipality of Plastiras, is rich in flora and fauna. It is worth mentioning the indigenous plant Centaurea Mesanicoliana (knapweed of Mesenikolas) which is one of the rarest in Greece. Crossing the central village road, two km of panoramic route along the mountain slope, we reach Morfovouni and from there Plastiras Lake. Morfovouni, the seat of the municipality of Plastiras, is built at an altitudeof 780 m, surrounded by oak and chestnut forests. It is the birthplace of the father of the general Nikolaos Plastiras, the painter Dimitris Gioldasis and other eminent men. There are traditional cafes, taverns, rooms to let and community guest house operating in the village all year round providing a comfortable and pleasant stay in a traditional and friendly atmosphere for the visitors. At Morfovouni square, below the church, there is the renovated cultural centre "Antonis Samarakis" and a bit further down the Plastiras Center for historical Studies founded in 1994. The center is open every Saturday and Sunday, 10:00 - 14:00, exhibiting photographs from the life and work of N. Plastiras (tel: 24410 95631). There are many and various cultural events held all year round at Morfovouni, but the most interesting one is the traditional double dance on Easter at the village square. The Women's union of Plastiras Lake is located in the Morfovouni centre specialising in sweet preserves and other local products sold in various points around the lake. At a distance of of approximately 2 km to the northwest of the village there is the monastery of the Holy Trinity (1858) with a church in the Mountain Athos style. Upon reaching the col, at the entrance Morfovouni, our visual field changes. Everything changes... 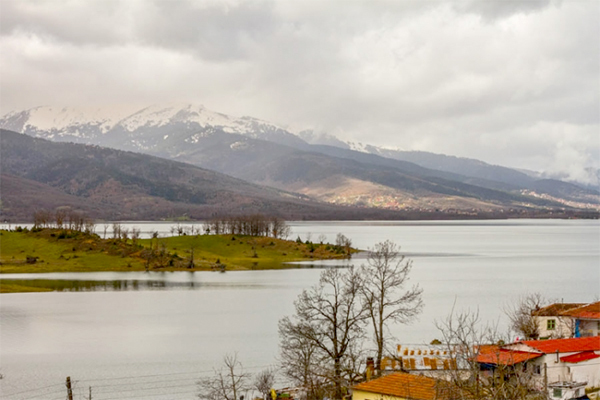 In front of us, the Nevropolis plateau, Plastiras Lake and the towering mountaintops of Voutsikaki and Kazarmas emerge. Two km after entering the Nevropolis plateau, we reach the Equestrian Club, at "Keramidi" location. The visitors can hear rest, ride trained horses in the meadows next to the lake and buy sweet preserves made by the Women's Union of the Plastiras Lake. On our way from here to the lake we come upon hospitable rooms to let and guest houses. 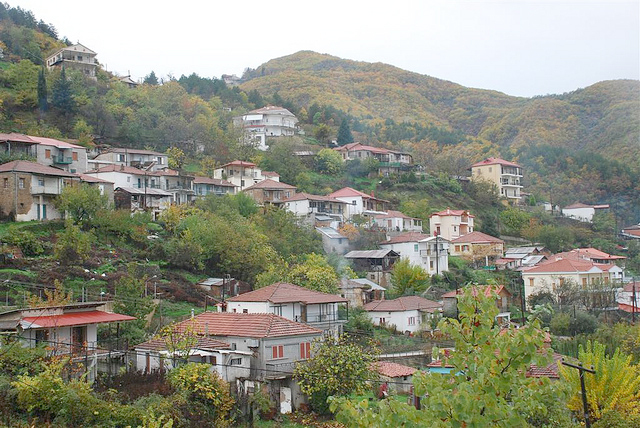 In front of us, on the "Monoplati" slope, we see Kerasia, a beautiful village of the municipality of Plastiras with traditional cafes and a rich history, also famous for the traditional festival in the last ten days of August. 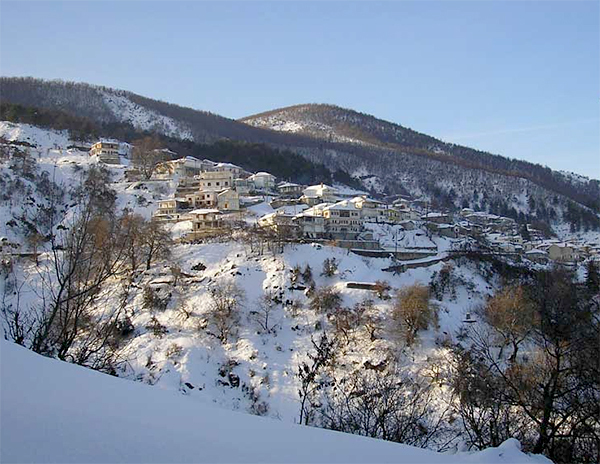 The village is on the Mouzaki - Plastiras Lake road axis, at an altitude of 950m, only 3 km from the lake and 32 km from Karditsa. In the extended forest area of the village, there is a network of forest roads suitable for strolls and recreation.